The product created by the Rock Star is sold at Confections of a Rock$tar® for a month. 100% of the proceeds are donated to a charity of the Rock Star's choosing. Glen Burtnik has released a number of major release solo albums in his career (gaining recognition on MTV in the late 1980s and early 1990s) and in addition to his own solo albums, Glen has written songs recorded by many artists including Randy Travis, John Waite, Jo Dee Messina, Neal Schon (Journey), Jan Hammer (Miami Vice, Mahavishnu Orchestra), Marshall Crenshaw, Patty Smyth, and Don Henley. He’s also had songs in a number of films (including Michael Bay’s blockbuster Armageddon). Glen is baking for the National Multiple Sclerosis Society. Read more in Artist Bios. 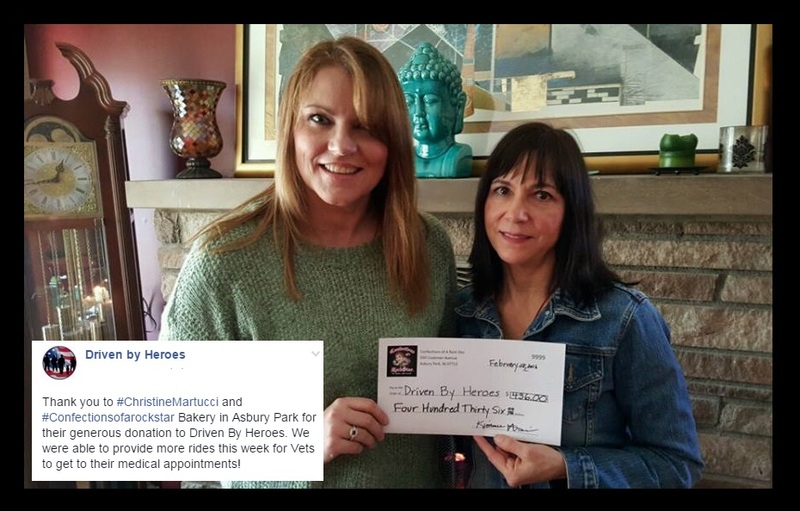 Christine Martucci delivers the donation to Driven By Heroes! HEY YOU! We've got more episodes coming your way, so stay tuned! Each month we'll producing a new episode. Check out our YouTube channel to see our full episode list. Looking to taste this month's Rock Star recipe? Visit us today!